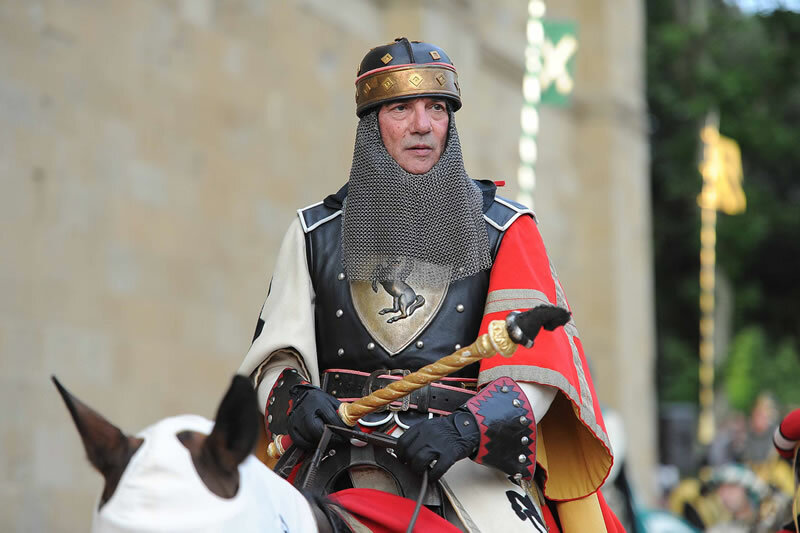 The Musician of the Saracen Joust are the soundtrack of Arezzo’s historical commemoration. The association was set up in 1955 in order to accompany, with the sound of clarions and the roll of drums, the entire historical procession for the Saracen Joust. 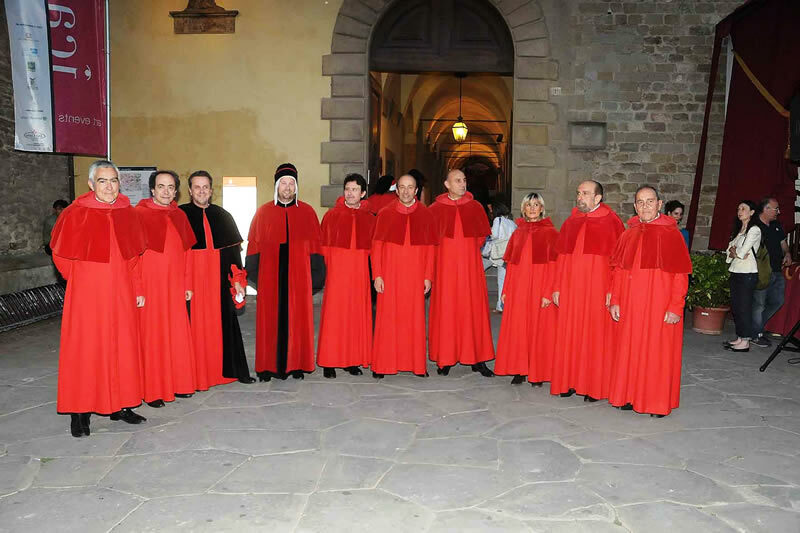 The Musicians Group consists of 43 elements, amongh which are a standard bearer, 11 drums, 27 clarions, a group leader, and 3 lucchi (walk-ons wearing a long, full cloth grown, thypical of 14th c. Florence). The Flag-Wavers Association has been participating to the Saracen Joust since 1931, covering the the role of flag-bearers of the 4 City Districts. 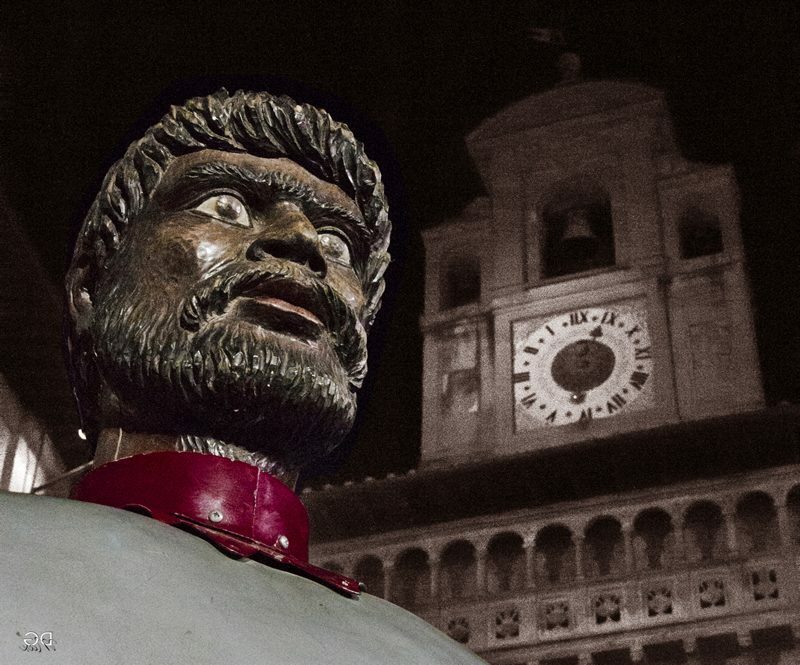 Every year, the flag-weavers open the entry of the procession in Piazza Grande. The accrobats challenge each other, showing off the traditional “skirmish”. Two standard bears give life to a battle, using blows with flags to symbolise the ancient contest between Good and Evil. The Foot soldiers of the municipality must carry out orders given to them by their Sergeant and mantain order in the field. To the foot soldiers, who are the expression of the Field Steward’s authority, is owed the greatest respect on the part of all the delegation. He is the voice of the Joust. He is the one who announce all the salient phases of the manifestation. 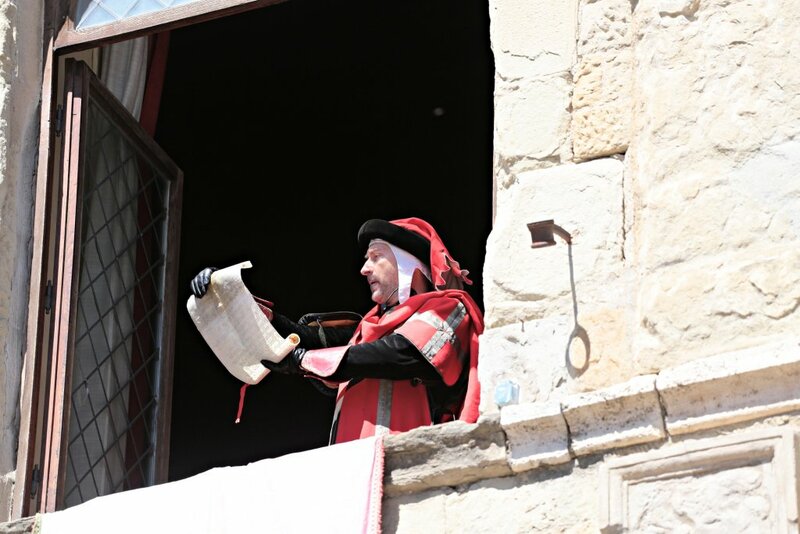 He reads the Proclamation during the procession, and call into the field all the delegation during the entry into Piazza Grande. He communicates every other order given in Piazza Grande by the Field Steward, by the Judicature, or by the Jury. The Buratto is the simulacrum of the Re delle Indie. On his left arm is equipped with a shield on which the scoring plate (targa) is insered to be hit, the points for which range from 1 to 5. 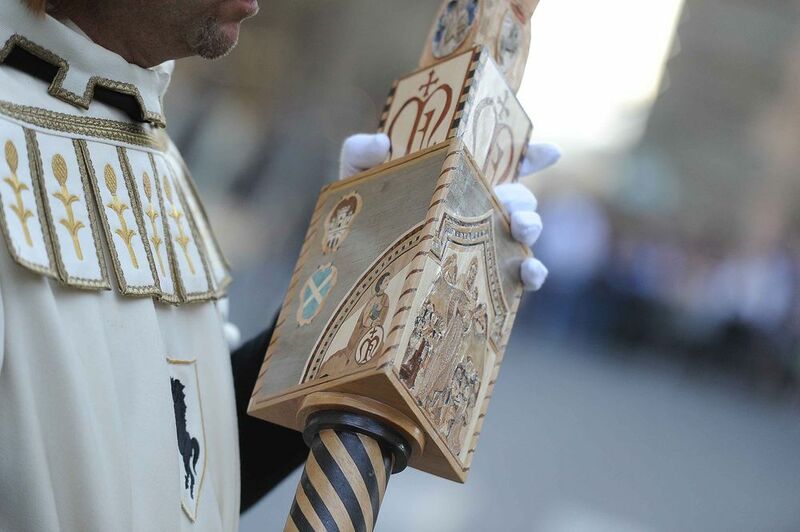 On the right arm, it is armed with a flail consisting of 3 leather balls (250 grams each) supported by long cords. Prior to each run, the leather balls are sprinkled by the attendants withh black powder in such a way that an imprint is left on the shoulders of the jousters should the Buratto succed in hitting him. The Buratto is looked after and served during the Saracen Joust by two Saracen attendants who wear Muslim clothes. 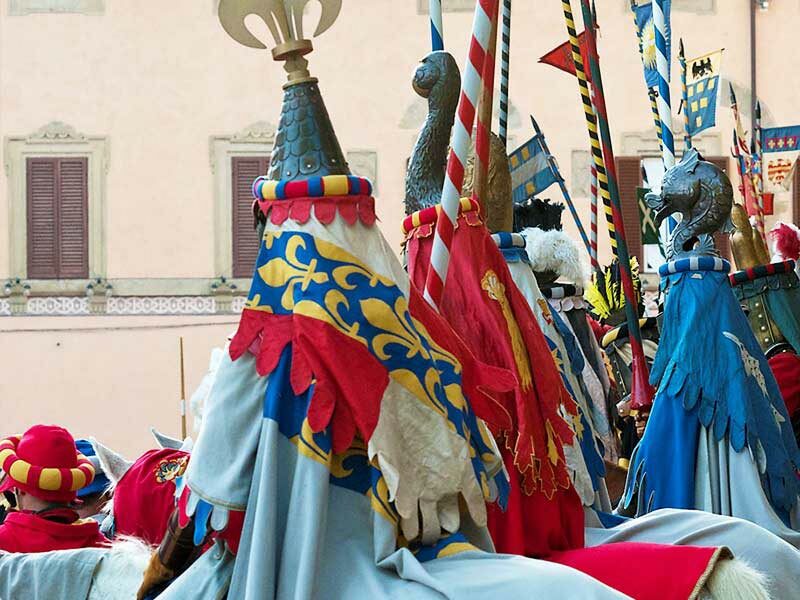 He records all the data of Arezzo’s historical commemoration in the “Book of the Joust”. 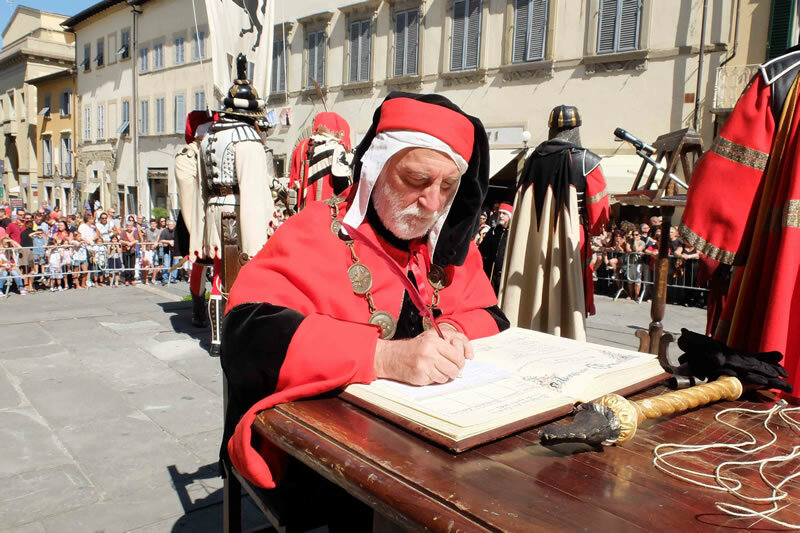 The Registrar notes down the personal details of the jousters and horses on the occasion of the registration of the horses and of the investiture of the jousters. 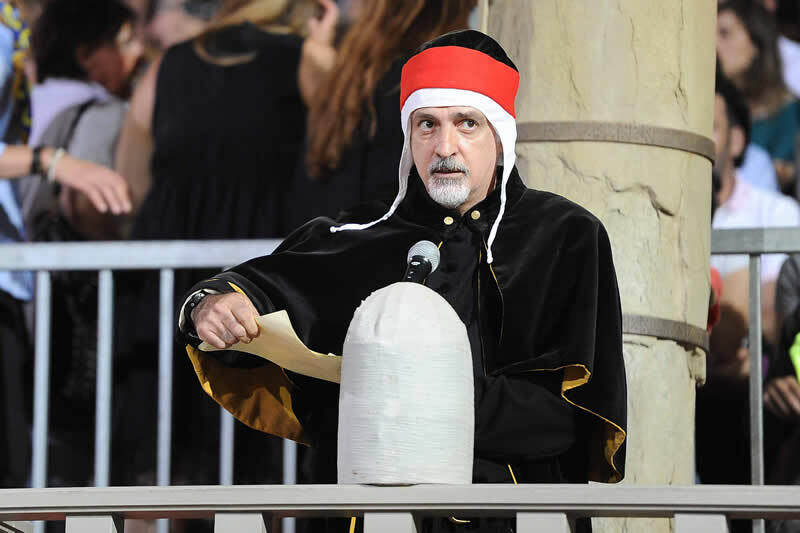 The Production Coordinator is responsable for the faithful execution of the programme schedules regarding the Saracen Joust and for all the other collateral ceremonies. He coordinates the assistant organisers of the Districts and supervises the behaviour of the walks-ons participating in the procession. 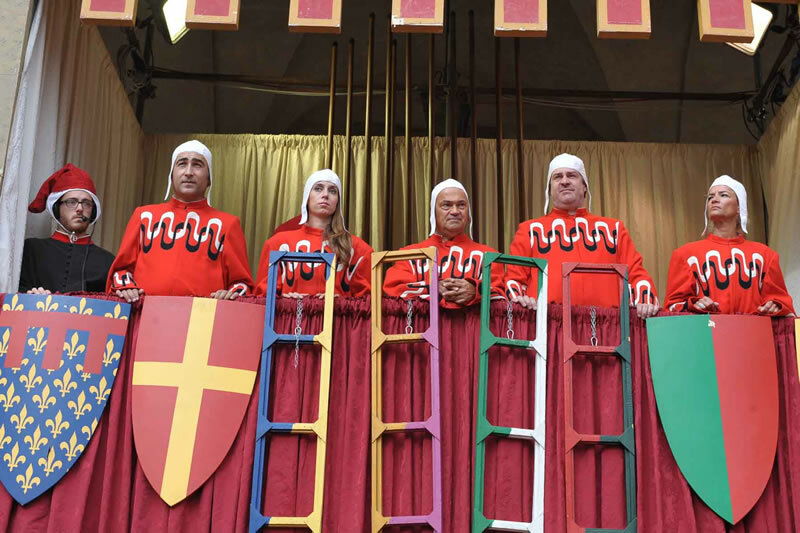 The scores realised by each jouster are determined by a Jury composed of 5 jury members who offer in the exercise of their dedicate function a full guarantee of competence, absolute impartiality and independent judgement. The task of assigning the score after having examined the score band is up to the jury members and to their final judgement. He is the highest authority in the field. He is the sole judge of all technical questions inherent in the carrying out of the Saracen Joust, and his decisions are irrevocable. He is assisted by two field helpers, one of whom on horseback who will take the position of Deputy Field Steward. The Judicature consists of nine Judges. It is the main adjudicating body of Saracen Joust and has the task of nominating the Field Steward and his assistants, the Herald, the Registrar, the Saracen attendants and the Sergeant of the municipal foot soldiers from among the persons who, in the exercise of their function, offer full guarantees of competence, efficiency and impartiality. From the Statutes of 1327 it emerge that the town was divided into four districts, whose name was derived from the main gates of the city walls: Porta Crucifera, Porta Sant’Andrea, Porta del Foro, Porta Burgi (whose territory corresponds to Porta Santo Spirito) which had jurisdiction also over the city walls on a territory divided into three concentric areas. Porta Crucifera had jurisdiction over the Tipper Valley. Porta Sant’Andrea from Cortona to the southern slopes of the Alpe of Catenaia, delimited on its southern side by the Chiana marshes. Porta del Foro had its sphere of action on the Casentino and Valambra. Porta Burgi on Valdichiana, and beyond the swamps from Civitella to Foiano. The four gates had power over civil matters, justice, and payment of duties. 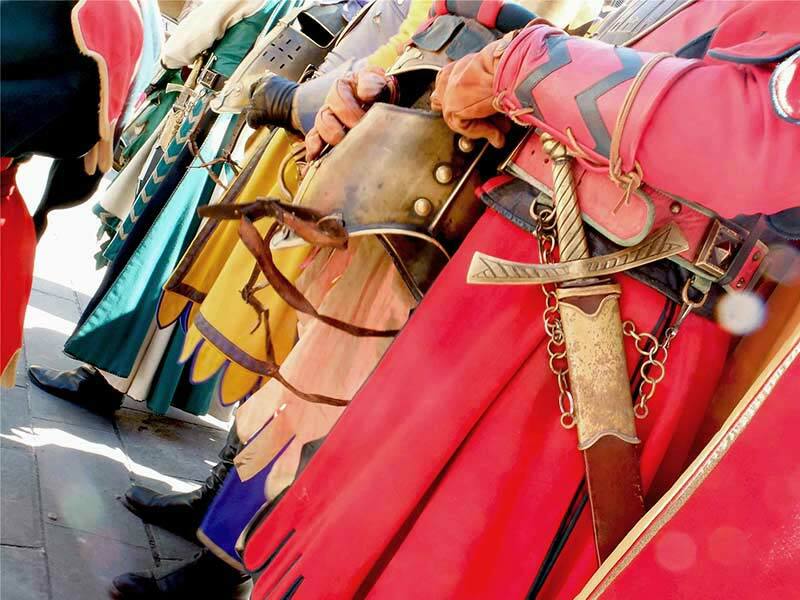 The knights of the Houst are the runners of the four districts who challenge against the Buratto, but they are not the only ones: the historic procession sees the emblems and the knights of the noble families of the town and of the landlords. They resided on the districts’ territories and held political and military power before the rise of the municipality. Porta Crucifera: Bacci, Bostoli, Brandaglia, Pescioni, noblemen of the Faggiuola, Countes of Montedoglio. Porta Sant’Andrea: Counts of Bivignano, Guillichini, Lambardi da Mammi, Testi, Barbolani Counts of Montauto and Marchesi Bourbon of Monte Santa Maria. Porta del Foro: Grinfi di Catenaia, Sassoli, Tarlati di Pietramelara, Ubertini, Countes of the Guidi di Romena, Cattani della Chiassa. Porta Santo Spirito: Albergotti, Azzi, Camaiani, Gausconi, Pazzi del Valdarno, Tolomei del Calcione. The care of the horses is a proof of the importance of the animals heath. 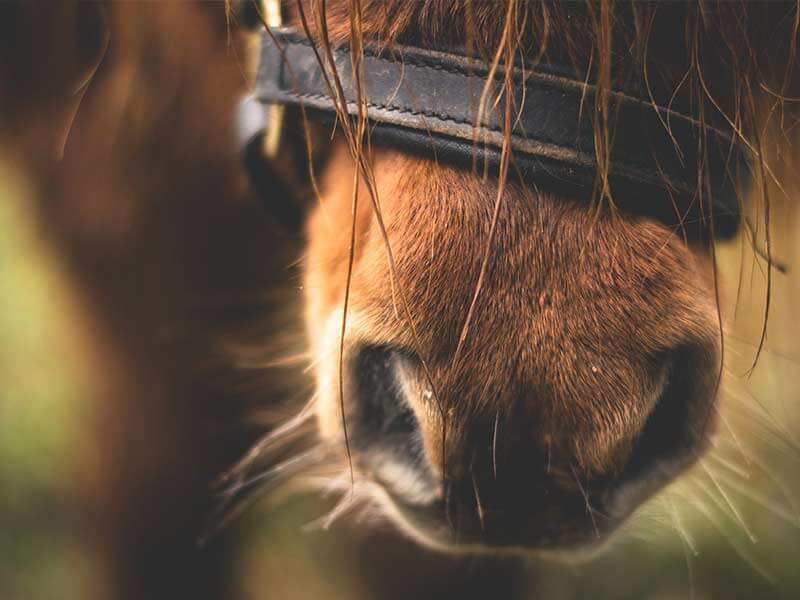 The analytical results of the analyzez performed on the biological samples collected from the horses during the various edition of the Joust, confirm the respect for the horses’ health and wellness and the jousters’ seriousness. The challenge – How to win the Joust? The participants dressed in costumes of the period are about 350 in all included soldiers, musicians, valets, flag jugglers, knights, jousters and infantry man of the Commune. The scoring plate of the Buratto is divided into 10 sectors corresponding to scores varying from 1 to 5. The center is marked by a red circle and is the best score realisable by striking the scoreboard.